My new bum-sniffing friend… | This is a blog. The awesome new addition to our family! He is too cool… I only had rabbits growing up, and my poor father ended up taking care of them, so this puppy is a really crazy experience. There is a whole new heartbeat in the house, and a whole lot of snorting. Like seriously, you would think there was a pig here! He is going to be a pretty big Frenchie… Right now he is 4 and a half months, and his paws are freakin huge, and he is already bigger than Kernie (Kendra’s dog and GBD mascot–BTW it is Kernie’s B-day today, Happy 5th)! We haven’t named our little guy yet… What do you ladies (and gentlemen) think we should call him? This entry was posted on September 12, 2008 at 12:08 pm and is filed under General Blog. You can follow any responses to this entry through the RSS 2.0 feed. You can leave a response, or trackback from your own site. He seems bored…. either that or he’s slowly calculating his attack angle on the camera! PS: sorry for the mistakes I am French. Waouh! Kristin your dog is sooooo cute!! ha ha, I love his face, he looks so quiet while you say he’s like a twister! So…concerning his name, maybe something like “Twisty” (don’t know if it has a real meaning in English or not) or maybe “Lucky”, cause he’s really lucky to live around such a great team! I think he looks like a Cousteau (as in Jacques). I just got a new puppy too. He’s a Maltese and curiously was given the very French name of Jean-Philippe. Since your new little bundle of joy is a French Bulldog, I would go with something uber French and literary, like a name from a Dumas or Hugo novel. He is beautiful by the way. OMG he’s so cute! Name him… Griff or Vincent! OR! Look at that face……..I am in love with that dog! I love English Bulldogs too…..so I would name him “Winston” ….after Winston Churchill. Don’t all Bulldogs look like him? His nose is cute too! We must have frequent pictures of him and of course, Kernie, together! His ears remind me of a bat. You should name him Battie to rhyme with Kernie. Wow. I’m terrible at naming pets. Either a Todd or a Duke. I got a puppy a few months ago he just turned 1 and he is as big as a lion already(seriously). But when I look at your dog he looks like a Big Fred haha… hmmm what else Buddy,Charlie, Einstein, Sammy. I don’t know, just stare at him awhile and watch him do what dogs do, it will come to you eventually thats how I picked my dogs names. hello here is a list of names of dog. it is years with the letter “D”. or if power is not with the leter “D” but good. Congrats for your new passion Kristin! For his name, what about Menelao, or Bullo (pronounced “Boollo”), or my third choice, Max. I’ve had multiple dogs growing up. Their names were Jesse, Cruiser, Queenie, Spike… to give you some ideas. a french dog deserves a french name!?! hahah i was going to name my bunny tuperware… but my mom didn’t like it…. He looks like a Norman. How about KoKo or Kiki. I was trying to think of something with part of both yours and Kendra’s names, so that’s where the Ks came from. I hope you come up with a name for him soon. What have you been calling him since you’ve had him? SHELBY!!! ese le queda exelente!!! Hahaha cute… the first thing I noticed about your doggie, were the ears… But I dont think “Dumbo” seems like a name to fit him. How’s about maaaaaybeeee… Bruskie(pronouced Bruce-key)… sorry I not too good with thinking up names. What a cute little fuzzbutt! He’s got a great face and ears, and you can already see the mischief in his eyes. He looks like a Charlie to me. By the way your hair is hot! It’s sassy and fun and there’s so many things you can do with short hair. Bobby pins came in handy when I had a bob… have fun with it! I belong to Brazil, I have a dog that if flame Leo, he is very similar to his. OK. I’ll admit: I’m with envy of the dog. I’m with SuzieQ on this. Winston is the way to go. As an animal lover I have to say that the dog is just “off the chain” handsome (no pun intended)! As for a name? In my opinion the name should reflect his personality, so I can’t really say given I don’t know the dog. However, I have always liked “Diogenes”, after the Greek cynic/philosopher, as he was always in search of an honest man. Dogs, like children, exude honesty by their very nature. One could always shorten that to “Dio” for simplicity. Of course, the comment from Grace (#29) would suffice…call him “Fuzzbutt”! Gotta love that…would be an awesome nickname, too! He looks dangerously like a Fluffy to me. And he is gonna be HUGE so fluiffy will be histerical. the first thing I notice were their ears! You should name him something taht rhymes with Kernie! like scotty or Dundie! ohh this going bad haha I’m terrible at this..
Or call him what i’ll be calling him, “lucky little git”. hehe. As for a name…I kinda agree that his ears remind me of Stitch…however, a French name would be really nice, calling him with the French accent of course, not like “Celeen Dionnnn” but as “Céline Dion” or at least, trying to…so cute 😛 Since it’s a boy “Louis” sounds like “him” in French: “lui” with your English accent of course hihi! or, with an end in “i” Zacharie /Zack, anyway good luck! Hello Kristin, your dog is very cute. He looks like a stuffed animal. I’m not good with dog names, but I think you should name him Blackie. My brother suggests the name Madden. I’ll try to think of some more names. How about naming him Kreukie? Hahaha. He’s a cutie, btw. I especially love those ears. Ooooo, Heathcliffe or Cliffie after Wuthering Heights! Then you’d have to get a Cathy, too haha. I suggest Shade for the name. His name should be Wilbur… as in the pig from Charlotte’s Web. Awesome book. Awesome pig. And an even MORE awesome dog! I have a Boston Terrier now and would looove a Frenchie one day! Great characters!! he looks like a franklin!! Puddin,(like pudding), Kai, and for some reason Benjamin? What about “Frenchie”. I think that works fine. 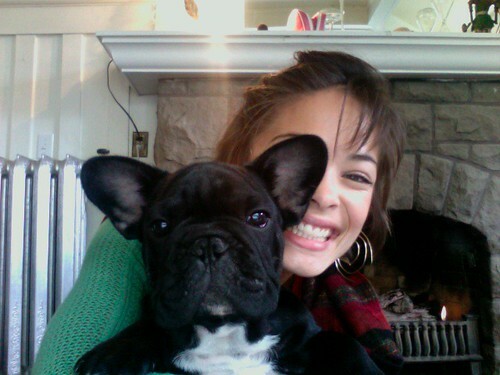 Awww,Kristin your puppy is so cute! I’ve been wanting a new puppy for a while now. My last dogs name was Sandy but your puppy looks more like a Bailey. I had a rabbit when I was growing up he was a grey&white floppy eared bunny named Thumber after the rabbit in bambi. Hi! It’s a cute dog….he doesn’t seem nervous about cameras eh jejej. How about WAYRO? It’s a great name, Wayro means Air or freedom in a language from Peru, so i think WAYRO it’s a great name for this pretty dog,yeah! you should name him brutus, jaques, or pierre. i always wanted a dog named brutus, but jaques & pierre are obv because of the french thang. OMG he’s so adorable! I love dogs! Sadly my dog died 1 1/2 years ago… but he was the most loyal friend one can think of! I wish you lotsa fun with your new family member and I promise you, he will be as dear to you as any other family member! Your dog is really really cute . I know it’s really hard to chose a name and after 53 comments you probably have already chose his name . It’s funny because I find he looks like to “stitch “(in “Lilo and stitch”) but of course your new puppy is more beautiful . I like uncommon names but I have to admit that it’s really hard to find . I am sorry because I don’t help you but BEST WISHES AND HUGES KISSES FOR YOU AND YOUR DOG. @Lorene: He IS stinky! He is a gassy little beast. He is so cute! I wish I had a puppy, if I did, I’d name him Bubba! Yeah! I agree with Melissa. I think Wayro it’s cool for your new doggie, besides Wayro suits him. Love it. I don’t know if you have found a name but after many reflexion I have another one .You can call him “léon” (I think it’s funny to call a dog as you could call a human being). He is cute and big he does not look his age! I got my dog when i was in the first grade and she is a bichon frise (a fat fluffy white dog in other words) her name is daisy which works since she is a girl but for some reason i get the feeling that he is big like a bear a black and white bear i guess like a panda bear but bigger so i would call him bear! Kinda lame i guess but i suggest that you choose the name that comes to your mind first just remember that you will be hearing and saying it more than your own name! good luck on choosing a name he is sooo cute though but then again i think all dogs are cute! @ Ash: U r right it’ll get scary! he looks like a Miles. His ears reminds me of Brain. In a cute way obviously. I have a cat that has ears like Brain hahaha. I’m with you Amanda! more pics of him! OMGosh that is the cutest freakin dog i’ve ever seen !! Besides Kernie we can’t forget him. He looks like a Shorty to me but I don’t know what do you guys think? Shorty is nice though. Gosh, naming pets is so hard. Our poor cat was called kitty for years because none of us could decide on a good name. Then last year we switched it to Catmandu, and then this year we’ve been calling him Baghera. Which is probably why he’s so neurotic! Lol, the poor thing just has no sense of identity in the world! I guess Dublin is a good one.. and maybe sometimes u can call him Dub-Dub, which i think is cuter.. hehe! Take Good care of your new puppy! Enjoy! I think his name should have significance. Like it should relate to how you first met him, or what he likes to do. I’m sure you’ll find that suites him. First, your dog is toooo cute! Whatever the name you give him, I hope he’ll bring you lots of fun! He is really so cute! for is name what about “licorice” for is color, or in french “réglisse”, is a cute name. I’m a french fan and I’m sorry for my bad english. The dog is cute !!! Why don’t you call him … hmmm … Kawaii ? It’s the synonym of cute in Japanese (I know that you have Chinese origins by your mother)… I’m happy to have found this blog and to correspond with you. You’re a great actress ! I’m impatient to see you in Street Fighter II ! – he’s dark-haired, has some star affectations like snorting & stinking and he obviously attracts good looking women. Dublin is already a good choice i think. It means “moon” in spanish. It fits better for a “she” but I like the name. Puppy is cute too !!! good luck! And whatever you name him he’ll still be one of the cutest babies i’ve ever seen. I search these in the internet what do you think? THESE WERE THE ONES I LIKED THE MOST WHAT DO YOU THINK.? Lol, so many name recommended by your fans, all the names sound great, i think mine will be the most simple one “Baby or teddy” – as someone said he look like teddy bear. He look adorable. haha~ It doesn’t look like a puppy at all, he look so huge.. Almost the same colour like my kitten =) Have a great time with him. cheerS! i have dog too. i named him after my grandpa, ED to remember my grandpa. maybe you could name your dog, is it girl or boy? if girl, name her after your grandma, if boy, name him after your grandpa to show you how much they mean to you so they would know how much you love them. does that help? smile…. I can’t believe only one person has suggested “Shelby” so far. I think you should name him Moose or Buddy or Rocky or AJ, or Scottie. Hi Kristin, congratulations! pretty puppy, a loved the dogs, I have a Golden retriever, I like me the U2, to you too, could put Bono. @Kristin: What names have you narrowed it down to? Kristin, you look so great!!! Ow!!! your pet is beautiful like you! Hey 2K – why not call your BUM-sniffing friend “el big dipper” or just dipper. Aww he’s a cutie! 🙂 He looks slobbery too, hehe. Also looks like a bunch of trouble. I would name him Chaos. He’s such a cutie! I think his name should be Benny. or if you want to go french truie which means sow. That is the most adorable dog EVER!!!! I used have a Pittbull named Tyson and a Rottweiler named Rex (my brother was like 7 when he named him), so I can completely understand having a big dog with big paws. They are really clumbsy at first, but they’re the most cuddly things ever. When I first saw your dog the first name that popped into my mind was POOKA!!! From the movie Anastasia. LOL Randomn but just a thought. Hee Hee. – Amir ( prince in arabic) haha becoz i think he will be the prince of the house. Shabasha, what about Shabasha as a name Kris? Name him ‘Killer’, haha. I’m just kidding, lol. If he’s a French breed, name him ‘Frenchie’ like you sort of already have. He is soooo damn cute 🙂 You really want to keep him ’cause if not, I’ll adopt him, too! I think he’ll like it here in Germany altough it’s very cold right now. This whole name giving thing sounds pretty familiar to me…what about Sam or Sammy? Personally,I would name him prince. Since the geographical suggestions are on people’s minds, I will make one related to the theme by suggesting a place relevant to me: Kashmir. I do think Dublin is a good choice. oh my god that puppy is sooooooo cute! loved it! hahaha, you people’s are funny. Hi Kristin, so here’s my k-9 naming logic. What do you think of or notice when you first look at your dog? Ears, nose, eyes,stature etc. To me it’s his color. Black and White but most importantly TUXEDO! So what animals have a Tuxedo coat? Penguins of course, name him Ping, short for pinguino, which is spanish for penguin. Ping is also a very cute name by the way. There you go, my omni-inspiring thought process in less than 120 words! how about Buckley? like Jeff Buckley? Top of the morning to ya! Dublin is a good solid name for a boy. Dublin is a very beautiful city on “The Emerald Isle”. There is a “Dublin’s Pub” in New York. If ya haven’t gone to Ireland, you gals gotta go!!! Its so beautiful there!!! first thought when i saw how big he was getting was marmaduke, the cartoon series. you could call him Duke, if he’s a bit high maintenance, or you could go for marmy. really depends on the dog. in the navajo culture we don’t name our babies until they are older, until we know more of their personalities. until then we call them awe’ or baby. of course this is a dog, but he’s still part of your family so i think it counts. Have you ever read or seen The Princess Bride? I was thinkin’ about how this character, Buttercup, names her horse, “horse”. I was talking about what we should name a dog with my boyfriend and we both thought it would be funny just to name it “dog” but I was thinking of spelling it D-A-W-G instead of D-O-G. No, I’m serious I would actually name my dog that! Looks like “Brain” (see Pinky and the Brain) ear-wise. why don’t you name him Licorice. I heard that was your favorite candy or a Hawaiian name like makana, it means the gift. He is a cute gift by the way… Just come names I thought I drop. I think that “HONEY” would Stick just right! “Woodstock” or “Zappa” would be my contribution to this “Name-the-puppy” contest (Obviously I’m a 70’s rock fan). Kristin don’t you forget to tell us what name you eventually chose for the cute lil’ thingy ok? What a cute puppy! I have a couple cocker spaniels and a delightfully mixed dog at home. Well, since he’s a Frenchie, how about mess with people’s heads and give him a British name like Jarvis or Nigel. Poe – of the Edgar Allen variety. Atticus – from To Kill a Mockingbird. Mom thought of the name Tobias without seeing the little guy. Tobias is a Greek version of the Hebrew biblical name “Tobijah”, meaning “Jehovah [God] is good”. In English-speaking countries it is often shortened to Toby. Not knowing what Tobias meant I had to look it up. I know when I say the name Tobias I can’t help but smile. And think it suits him perfectly. Good luck with picking the perfect name. He looks like a “LUKE” to me. Awww Kristin he is soooo cute! Congrats on your new ‘baby’. I’m somewhat partial to Tux because of his colors. One of the earlier commenters also mentioned Costeau from Jacques Costeau and I think the first name, Jacques, could work as well. oh….kristin, your dog is so cute!!! p.s: I like your new haircut!!! Name him as called some of your lovest person. Or as one whom you missed (who died or leaved you in other way). My dog was named “Nika”, but how I see it is a male. So name him “Hurricane” as he’s so… don’t know how to say, like a pig. Or “Ike”, think it’s cool :D. OMG!!! Your puppy is too cute!!!! And the way you describe him it looks like he really is going to be a big big dog. I just love animals by the way and especially dogs!! They are wonderful companions. I think you should name him either Tyson or Champ!! Either way it’s your decision since it’s your dog. He is going to make you really happy and he really is going to make you laugh and a lot!! Have fun and enjoy him!! Wow! So many responses… Thanks guys! We have officially named him Dublin. He is really a wonderful creature, AND he is snoring under my coffee table right now. You will of course be seeing more of us! How about Krypto the super dog? He really seems so cute and also he seems he is a little devil! Hey, I think you can name him Désiré. Because you absolutly want this dog and in french it’s traducts by Désiré. he sure is a cuddley one , I hope his name. “Dal” is a beautiful name for a beautiful dog with a lovely lady. hey i think mybe shadow is a cool name for him. or maybe hersheys hahaha im sure you ll pick a cute name. You are made to the one for other one. Lol, he is great darling! Vous êtes fait l’un pour l’autre . Lol, il est super mignon! Ares, I always thought Ares was a cool name. so….at first i just want to say that you’re an amazing woman….so strong and natural at the same time….you’re an icon for me….i hope that you never change….the dog is black and white so….bunty (the chocolate….lol) is great or lucky (my dog’s name)….tyson is great too….or fluffy….if you want a very french name…just tell me because i speak french very well…lol…can you tell me a little bit more about your association??? i’m very interessted…..well i said all the tings i’ve to say…..a lot of kisses from a big fan…. Kristin, at you a good dog. Casually a cat it is not necessary to you? And that I would give it to you. i just got a 6 week old puppy, i called her gumby like the old school cartoons. I think you should call your bum sniffing friend saunder. Hello, he reminds me of Mickey, and would want to know where’s Minnie really at? Enjoy, & take c8re. Kristin, why dublin? is it because your bf mark is in dublin at the time you got the pup? hmmm..